I’ve been playing with the new pizza stone I got for my birthday — pizza on the grill is amazing and makes for such an easy dinner. 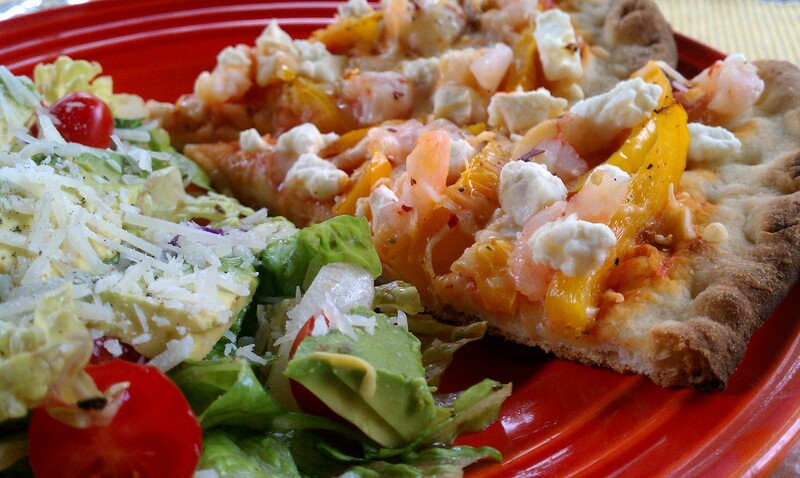 My daughter Samantha actually made the request for a shrimp pizza (yes, I was thrilled), so we decided on shrimp, feta, and grilled yellow bell peppers (for my half). 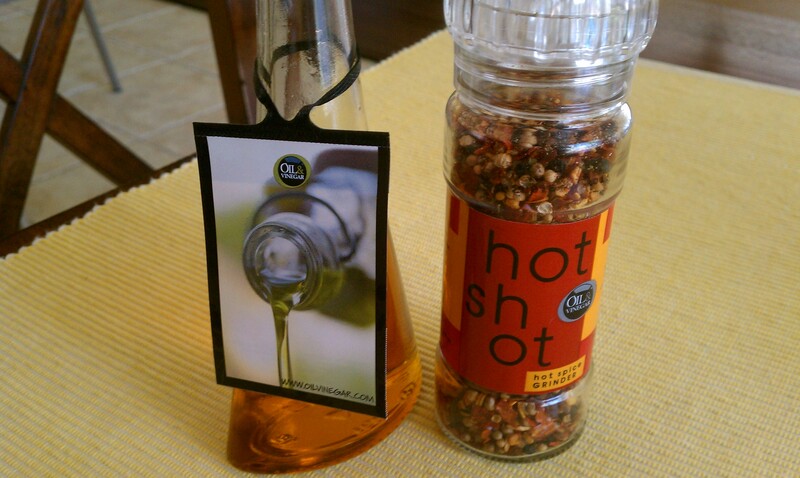 I’ve previously written about all the delicious ingredients I’ve picked up at Oil & Vinegar at Watters Creek, and this was the perfect opportunity to put my two latest purchases to use: Peperoncini Oil, and the “Hot Shot” spice grinder. 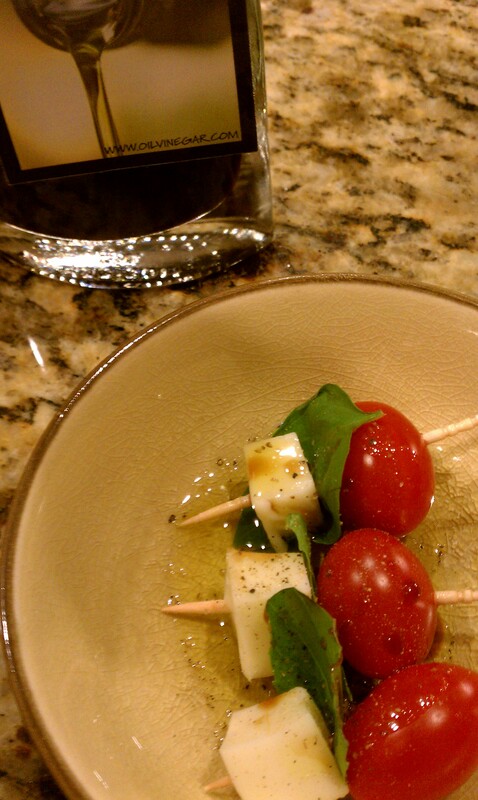 The Peperoncini Oil is light and flavorful with just a bit of spice. The Hot Shot spice grinder contains all kinds of wonderful things: chili pepper flakes, sea salt, mustard seed, coriander, onion, garlic, and paprika, to name a few. We brushed the pizza crust with the oil, then topped with a bit of tomato sauce. Next we added cooked shrimp, grilled bell peppers, a little shredded cheese (a 4-cheese blend), and lots of feta cheese. Finished it off with a generous amount of the Hot Shot spices (only on my half!). Delicious. 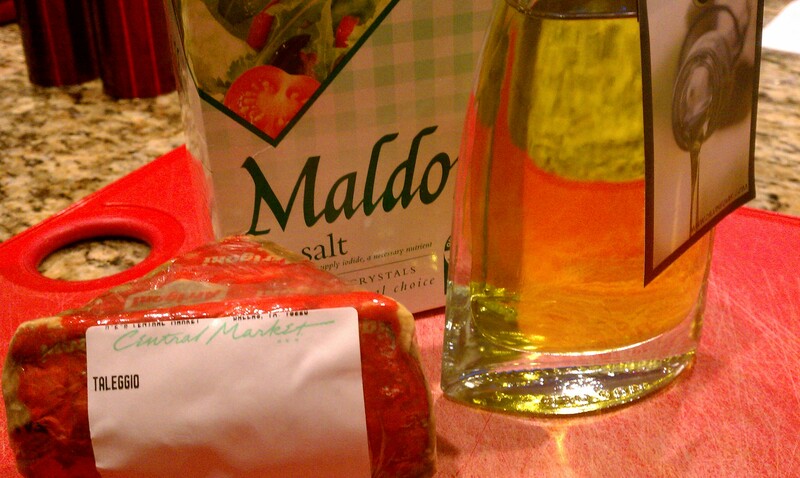 I recently found myself cooking for one — this hasn’t happened in at least seven years (the age of my oldest child). I figured I should take advantage and make something that would drive my kids to tears if I ever served it to them. Let’s see…lots of vegetables, extra strong cheese, and more vegetables on top: perfect. The lovely White Truffle Oil I picked up at Oil & Vinegar has been burning a hole in my pantry waiting to be used, so I decided to create a new version of the mushroom and taleggio cheese flatbread that my Mom has made for us in the past. Preheat over to 400F. Toss mushrooms, tomatoes, and EVOO on a cookie sheet; sprinkle with salt and pepper. Roast in the oven until the tomatoes start to burst, about 12 minutes, turning half way through. 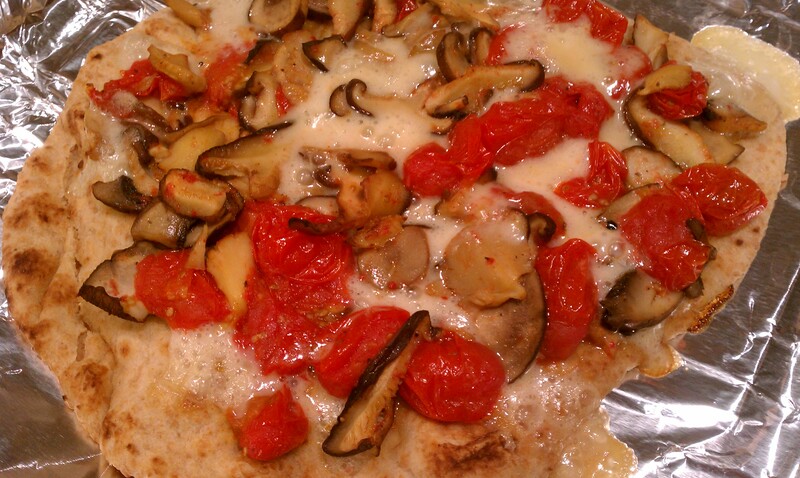 Place flatbreads on a second cookie sheet and top with cooked mushroom/tomato mixture. Dot taleggio cheese over the vegetables and return to the oven until the cheese melts, about 5 minutes. 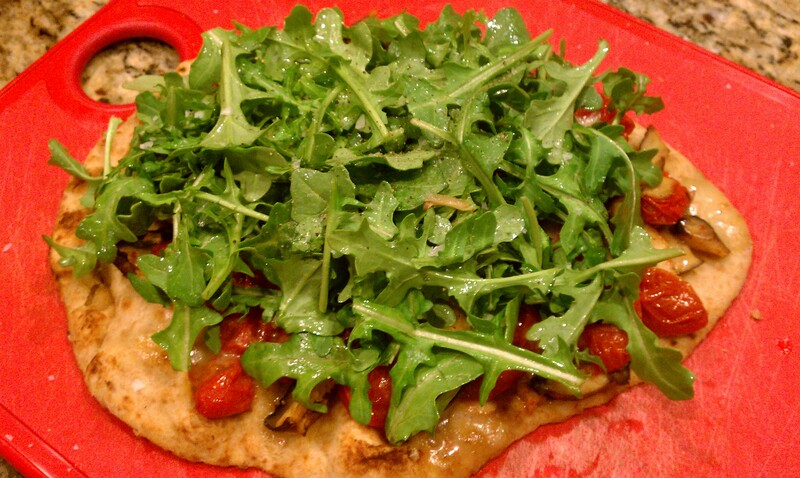 Toss arugula with truffle oil and place on top of cooked flatbreads. Sprinkle sea salt on top (this is the best part). Serves 2-3.